Question: Since smoking is not [considered as] food or drink, and nor does it reach the stomach, then is it [considered to be] that which breaks the fast? Response: So, we say to him: Certainly smoking is haraam in Ramadhaan and other than Ramadhaan and in the night and in the day. So fear Allaah (Subhaanahu wa-Ta’aala) regarding yourself and abandon smoking. Save your health, teeth, wealth, your children and your active ability with your wife such that Allaah (Subhaanahu wa-Ta’aala) can bless you with good health. 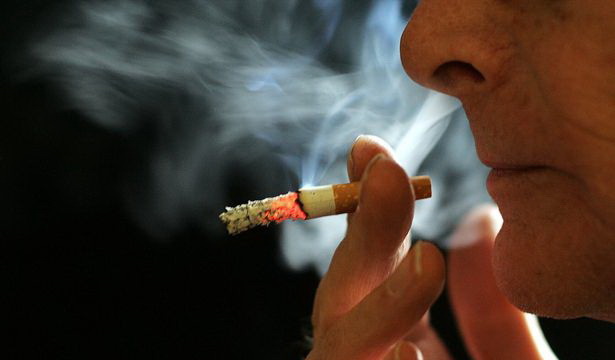 As for his statement “…smoking is not a drink (sharaab)”, then my advice to him and the likes of him is to fear Allaah (Subhaanahu wa-Ta’aala) regarding himself, his wealth, his children and his wife because all of these are affected by his smoking. I ask Allaah for protection for him and his Muslim brothers from that which causes Allaah (Subhaanahu wa-Ta’aala) to become angry. And with this it is clear that smoking breaks the fast in addition to committing a sin.